This is my sixth time making this cake in just over a year – yes it’s THAT good! We celebrated Shawn’s birthday with the exact same menu as last year – Smoke House Ribs – Mac & Cheese – Panzanella Salad and CAKE! Just to clear things up – this isn’t brother Sean – it’s Stephanie’s Shawn. They have moved to Indiana so we had to high tail it on over to their new house to celebrate – good times – good times – we miss them dearly! …………funny story – Stephanie recently answered the door and was asked if her parents were home. She’s 30! She’s sweet and petite and I’ve always told her that if Maggie from the Simpsons had a voice it would be hers! Anyone who knows her can go ahead and laugh their asses off – I know I am! We can all thank Deb from Smitten Kitchen for enticing me to not only bake this gorgeous cake, but also to buy the cookbook. Sky High cakes is LOADED with gems and I look for every opportunity to bake one of her cakes. It’s hard though because everyone wants this one. Each time making this cake I’ve changed it up a bit and believe this to be the cream of the crop! I like to make this cake in parcels and start several days and up to a week in advance. That way it’s not so overwhelming. The layers of cake freeze beautifully and it’s actually easiest to frost it frozen. The frosting will also freeze, but can hold in the fridge for well over a week and the Peanut Brittle, if you choose to make it from scratch, will last weeks and weeks if you can avoid the temptation and keep it out of humidity. The day of the celebration is for assembly ONLY! – truly the easiest cake EVER and no mixer needed! I used a pound of each – I like plenty of frosting – and don’t mind if there’s extra, but go CRAZY if there’s not enough! This amount worked out perfect! Slowly add Powdered Sugar a cup at a time and blend until smooth. Store in Ziploc bag in fridge or freezer. – at end of post – I finally just made a half batch so I wouldn’t eat the other half! Melt over double boiler until smooth. Cool so it’s still runny but won’t melt the frosting. It’s a tricky combination – too hot it melts the frosting on the way down – too cold it globs along – it’s tough and I still have a hard time with it. Pour over ganache that’s NOT HOT. Pour in center and help it along to the edges. 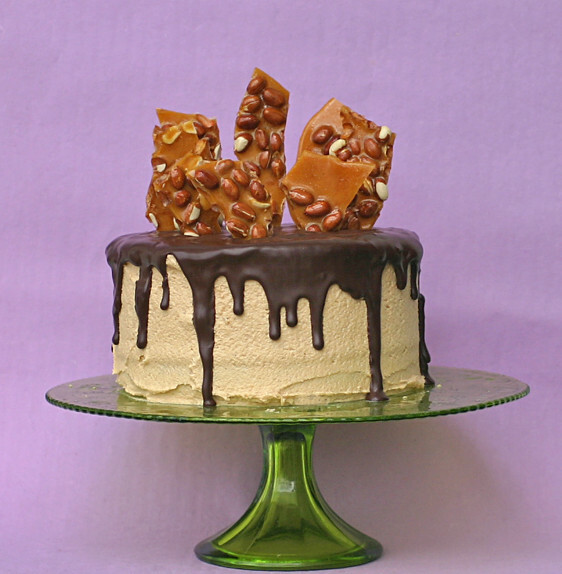 Just before serving stick in peanut brittle pieces – if you put it in too soon – they’ll likely fall over. I can attest to this being one of the best cake taste sensations ever. Hey, Mary, where’d you get the Tiffany’s colored background? Beautiful! Great pics. Thanks Kate! – It’s an illusion and a secret 😉 it’s really just a piece of poster sized construction paper. That cake is magnificient!!!!!!!!!!! WOW something that you’d see in a display window or magazine! great job!! So pretty! I love the peanut brittle, so cute! Great photo too! construction paper is a great secret to know! Mary come make this for me!!!! hehe Looks so very good!!! Beautiful and terrible at the same time! Beautiful mostly, but I’m sick so it’s terrible that I can’t jump up and make this immediately. The color of that cake is just too much! oh but there’s always tomorrow my dear. Hope your feeling better then! This looks so decadent, it looks like a crown! Love the peanut brittle, such a lovely touch! This picture takes my breath away! Beautifully done, bravo. I love Smitten Kitchen, but you have outdone Deb! I can’t wait to try this cake. I hope I am able to make something as magnificent as this! You are too kind – Thank YOU! You’ll do fine – just don’t do it all in one day. Let me know, when you do make it, how it goes. You are trying to make me fat, aren’t you? You come off with these mouth-watering photos…tasty looking recipes…and you want me fat! Huh? awe shucks – thanks! I’m always happy to leave the cake behind or send it along – it’s a rule we have to have company or I don’t get to bake them! Oh c’mon now Mary, you are trying to kill me for real!!!! Sour cream, chocolate, and home made peanut brittle. This is definitely a heavenly cake! Thanks Miss! And to think I almost skipped over posting it on Fbz too- by accident of course! Wow! That is beautiful and looks so incredibly good. 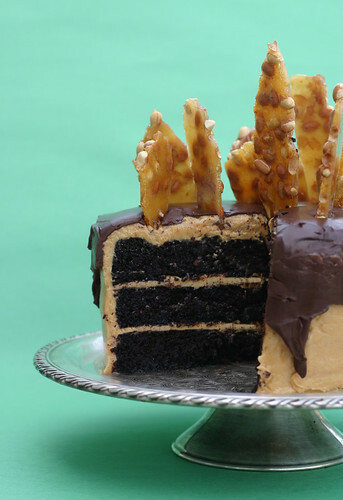 I have a friend who adores chocolate & pb together – I’ll have to make this for her. very good looking cake! great tip on the cake base too! just 1 question: after frosting the cake frozen, u put it in the fridge until it’s ready for ganache, how long does it take for the cake to become soft and moist? 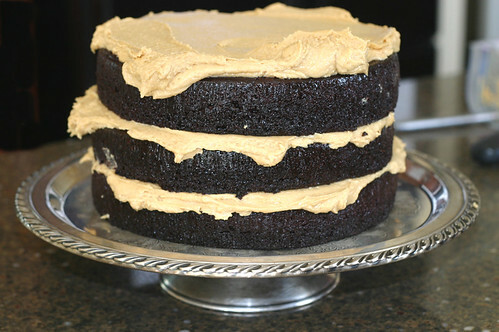 Not long at all – it’s usually already thawed by the time I’m done frosting it – it’s that fast. Wow, that looks AMAZING! YUM! OMG I could eat this all up. Wow. Oh, wow! That is beautiful but I won’t ask about calories. Birthdays are times to forget about calories I think. whoa! I want a slice of that! I wanna attempt this for a friends 30th at the weekend…looks amazing!!! Might be in touch nearer the time if needing some help! Well – get started on it now, now! Good luck and most of all ENJOY it no matter what it looks like. WHOA! That looks Amazing!! I want a piece now! Does it make me more patriotic if I salute this cake, because I just did. This has to be so delicious, all the ingredients are perfect…you can just taste how good it is by the recipe….! I served this cake to my coworkers today for a birthday celebration; it was a big hit, enjoyed by all. Thanks for sharing! So glad it worked out – and thank you for coming back and letting me know!